The opening salvo of NFL free agency is always a mess, and with the excess of salary-cap space this year, the numbers will get only more distressing. Just think, quarterback Brock Osweiler's huge contract with Houston will look like a blip on the radar screen two years from now. But what this should do for the smart NFL teams is create an opportunity like what the Patriots have been pursuing for years. Rather than compete for the absolute top of the NFL free-agent market -- a place that only rarely has star-caliber players -- those teams could try to scour the expired rookie contracts for gems. New England, of course, is even more proactive in this arena, trading for players such as Jabaal Sheard and Kyle Van Noy before their rookie contracts even expired. But with free agency, these risk-averse teams will no longer have to give up draft-pick compensation for reclamation projects. Why he's available: Burkhead was an interesting college prospect at Nebraska but wound up as a sixth-round pick of the same team that used second-round selections on Giovani Bernard (2013 draft) and Jeremy Hill (2014). Burkhead's sample size of 87 regular-season carries is incredibly low on his NFL career. What he does offer: Despite Burkhead vastly outplaying Hill in short samples last season, the Bengals continued to pound the rock with the player they believed in more. To quantify this further: Burkhead finished first in rushing defense-adjusted yards above replacement (DYAR) among all players with fewer than 100 carries. Hill was 25th among 42 qualifying backs in the same statistic, finishing with five times less DYAR than Burkhead in triple the carries. Burkhead also fits the new breed of running back who doubles as a receiving threat out of the backfield. 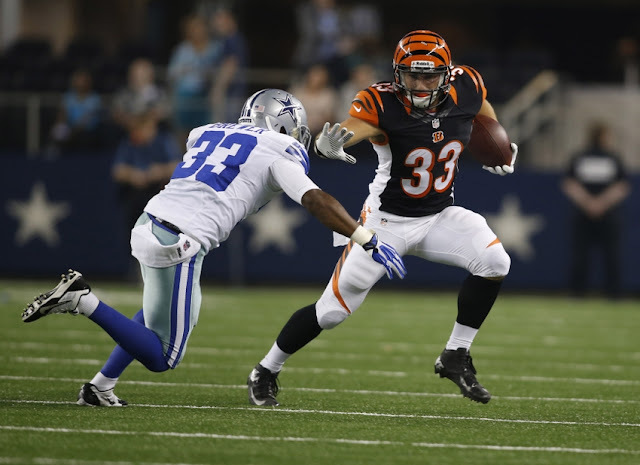 When injuries banged up the Bengals heading into the 2014 season, Burkhead was asked to be a slot receiver and gadget threat, and he performed admirably. The free-agent running back market is often ugly, and advocating a huge contract for a back is a step I'm not willing to take. But Burkhead doesn't come with the usual mileage caveats of backs in free agency, and he just might be able to elevate his game and become the next Shane Vereen.